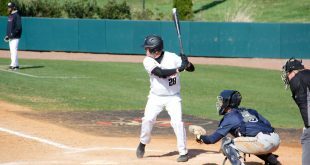 Following each conference baseball series, I’ll offer my thoughts from the weekend, as well as touching on other behind the scenes notes in APSU baseball. 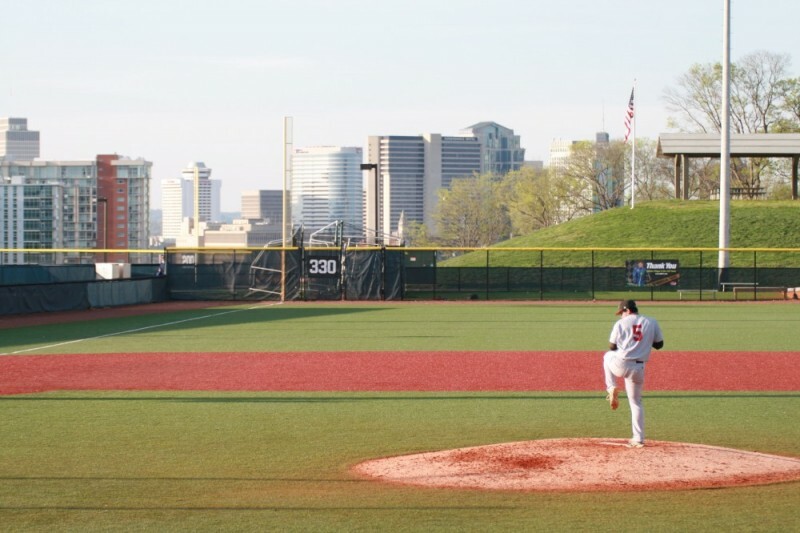 This weekend, I was in Nashville as the Govs took on Belmont in a three-game series from Rose Park from Thursday, April 17 to Saturday, April 19. APSU won the first two games with scores of 3-0 and 3-2, but fell 4-2 in Game 3. Alex Robles deserves his own section. The freshman has rightfully earned it after pitching a marvelous game on Thursday, shutting down the Bruins with a complete game one-hitter. He becomes the first to do so at APSU since 1997 as Craig Smith did so, but Smith’s was a seven inning game. This just makes the performance by Robles even more impressive. The lone hit Belmont had was a bloop hit to right field, and also walked two batters. However, the right-hander recorded a new career-high in strikeouts with nine, even though he didn’t feel comfortable with his slider prior to the game in the bullpen. His catcher, P.J. Torres, said it was shaky when the two played catch, but once Robles stepped on the real mound to face his first batter, it worked effectively. Some may question how much of a difference it made to have one of the worst hitting teams in the conference face Robles. But despite a .231 team average, Torres says it wouldn’t have mattered who was standing at the plate. As Robles paved the way for the APSU pitching staff, Jared Carkuff and Alex Belew followed in his footsteps. The sophomore picked up his first collegiate win by going six strong innings, allowing just one run on four hits. Carkuff made six starts last year, and admitted he was a bit fatigued once he reached the sixth inning. But after walking two men with two outs in his final inning, Carkuff flipped the switch to end his outing with a strikeout. Meanwhile, in Game 3, the senior Belew started on the mound for the first time since March 22, 2011. In that contest against Western Kentucky, Belew only went three innings and took the loss. But on Saturday, Belew put the Govs in a great position to win. Even though he didn’t factor into the decision, you can’t deny how impressive he was. The left-hander pitched four and one-third innings, and gave up just two hits while walking two men. Belew did his job to give the Govs a handful of innings on a staff day, and said he approached it just as he would have any other relief appearance. Belew leads all full-time, active pitchers on the team with a 2.25 ERA, and has held opponent’s to a mere .203 batting average. After last weekend, McClure said he hasn’t found anyone consistent enough to take over as Game 2 or Game 3 starters. However, those spots may have been filled for the time being. Pitchers were treated to three solid games of defense behind them, with the only error committed on the weekend being an overthrow by Torres to second base. You could label a few plays as being “gold star”, so let me try to remember them. First baseman Dre Gleason made a painful-looking stretch to put out a runner in Game 1. Torres made a diving catch on a pop foul in Game 2, scrambling up out of his stance to lay out for the ball. Kevin Corey robbing a base hit by extending himself to catch a line drive to his left, also in Game 2. Garrett Copeland making two nice plays on grounders from his second base position in Game 3. Logan Gray recording seven put outs with no errors on the weekend. I could have had a very long “Things I Liked” section, but they were worthy of being separated. If you aren’t familiar with Belmont’s field, it’s all turf. It may look like dark brown dirt in the infield, but don’t fall for it. Some players love it, while others aren’t fond of it. The shortstop Gray is one who prefers it. The Govs still lead the conference in errors with 77, but overall, they are improving in the field. Let’s just hope they don’t become spoiled by the turf as they return to dirt. Is there a way where APSU can only play two-game series? For the fifth weekend in a row, the Govs have lost the third game of a three-game set. To make matters worse, they have failed to win three games in a row this season, which is becoming a curse it seems. Going back to what McClure said about pitching, it’s a matter of consistency that the Govs aren’t showing. I think what Belew said after Saturday’s game described it perfectly. A couple of those losses have been by wide margins, but three have been lost by three runs or less. 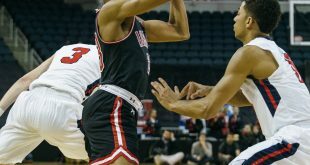 Those are games that could come back to bite the Govs as they look back on this season. A summary of the other things I liked over the weekend. The second batter of Game 1, Kevin Corey, hitting his first home run of the season to left field. So hard to keep him out of the lineup, and he should be in there with a lefty on the mound. Cayce Bredlau and Ridge Smith both going 2-for-4 on Thursday, and also laid down two timely executed bunts in a row. A two-run homer by Torres in the seventh inning of Game 2, which were the eventual winning runs as it broke a 1-1 tie. A.J. Gaura pitching two strong innings in relief of Carkuff on Friday. The right-hander continues to pitch well late in games. Ryan Quick blowing a fastball by a hitter with the potential tying run standing at third base, earning the save. Whenever the glare off the AT&T (‘Batman’) building finally went away. Everyone was glad when that second sun moved on. The base running by the Govs as a whole. Six stolen bases, including a double steal to score a run in Game 3, with just one caught stealing over the weekend. The speed in the Game 3 lineup from 8-3: Gray, Hamilton, Copeland, Bredlau, Gautier. Scary good. A pair of doubles by Gray in the same game, increasing his season total to 10. The dugout reaction as Coach McClure tumbled over when trying to avoid a play at third base in Game 3. Priceless moment. The Govs will return home to take on Middle Tennessee in a mid-week game on Wednesday, April 23 before hosting Eastern Kentucky next weekend beginning on Friday, April 25.